Welcome to our Diamond Infinite Edge review. 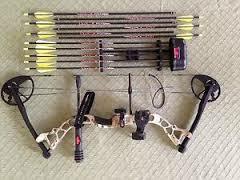 Diamond bows are made by Bowtech, one of the finest compound bow manufacturers in the world. 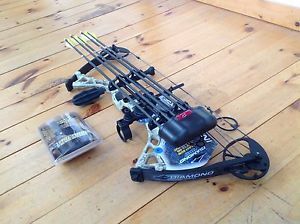 If you’re looking for a compound bow for a kid, youth or female who’s just getting into archery, you’ve just found it. The range of adjustable settings on the Infinite Edge is just staggering – you could get it for a 5 year old kid and he/she would still be able to use it 10 or 15 years later. 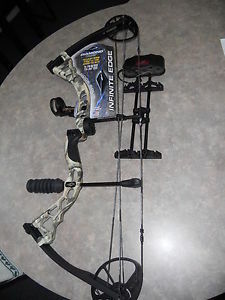 Don’t get me wrong: there is no reason an adult male could not shoot this bow. With the proper settings, it’s just as suitable for hunting as it is for target practice. As far as youth and children go, this compound is only rivaled by the Bear Archery Apprentice 2. 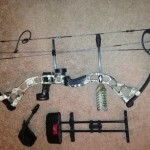 This bow came fully assembled and was ready to shoot right out of the box. 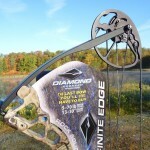 The Diamond Infinite Edge is based around a dual cam eccentric system. Both cams are elliptical and their movement is synchronized together for perfectly straight arrow travel. This cam system is really top notch, and don’t let the fact that this bow is marketed for children and youth trick you into thinking otherwise. These cams are very smooth, which sacrifices a tiny bit of speed (FPS) in exchange for a starter-friendly draw cycle. 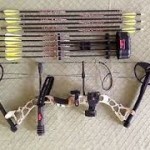 Perfect for beginner archers who are just starting to learn proper shooting form. The cable slide is very smooth, sturdy, and does not “pinch” the cable. Other archers seem to agree with this as well. What’s particularly interesting about this compound is the diversity of draw weight and draw length settings. Draw length can be anywhere between 13″ and 30″, while draw weight can be set to anything between 5 and 70 lbs.! Unless the shooter is a VERY tall adult, I guarantee a suitable setting for the bow will be found. You buy the Diamond Infinite Edge for your kid and it comes set to the “C” range. Your kid can adjust draw weight from 5 to around 30 lbs. and draw length from 13″ to around 18″. A few years later, this range is no longer enough for your kid. So you take the bow to a shop and have them switch the range from C to B. Your kid can now pick from between 31 lbs. and around 50 lbs. draw weight and 19″ to around 25″. A few years later once you need more than 50 lbs. of draw weight and more than 25″ draw length, you change the range from B to A at the shop one last time. 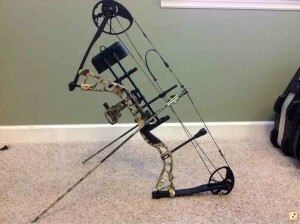 The IBO speed rating of this bow is 310 FPS. All IBO ratings assume a setting of 70 draw weight, 30 draw length, and 350 grain arrows. The lower your settings and/or the heavier the arrow, the lower the FPS will be. See our guide on determining REAL bow speed to understand how different settings will affect actual shooting speed. Keep in mind that from a young archer’s perspective, shooting speed is not that important. You’ll want them to focus on proper form and accuracy at short distances, and FPS does not matter much in these scenarios. Only once your kid grows older (or if the bow is being used by an adult) should you start concerning yourself with speed — and at that point, you’ll be using the higher bow settings, where FPS is solid. The cams are not aggressive at all, and ramp up to peak draw weight happens slowly and very smoothly. There are virtually no noticeable humps throughout the cycle, not even right before the Valley. This smoothness holds true regardless of the settings of the Infinite Edge, which means the draw will remain consistent over the years as you or your kids practice shooting. The Valley is also very wide and forgiving of forward “creeping” of the string. Overall, the draw cycle on this bow is perfect for its purposes: being forgiving for beginner and intermediate archers who’s main focus should be proper form, rather than trying to solve problems with or adapt to a rough draw cycle. Since the Infinite Edge is mostly for young beginner archers, it needs to be very light-weight so as not to over-tax the muscles and to make it comfortable to shoot for extended periods of time. As a result, not a whole lot of vibration/noise dampening accessories have been installed, as this would have increased the weight of the bow. Even more, a very quiet performance is most important in a hunting scenario, and most beginner children and youth won’t be going hunting. With that said, the bow is pretty quiet as is. Definitely not as quiet as the more expensive compound bows out there with tons of vibration dampening technology, but still quiet enough not to be annoying whatsoever. There is a decent string stopper built into the riser and which will eliminate string vibration. However, there is virtually zero hand-shock, which was quite a surprise for me and my younger sister as well. If you ever need to silence the bow even further, get a bow stabilizer, some rubber string whisker silencers, and maybe a Hush Kit for the limb. This is definitely not a requirement and it’s only something to consider down the road. 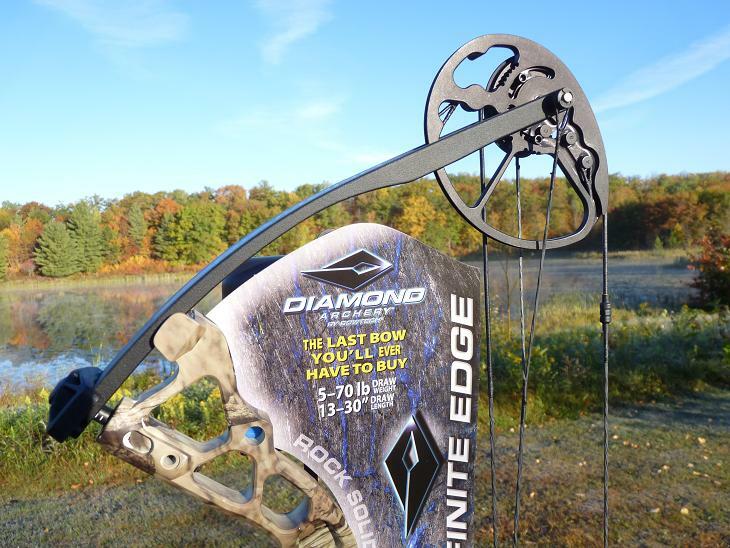 At maximum settings, the Infinite Edge is more than capable of taking down the largest game in North America, even from as far as 50 yards away. 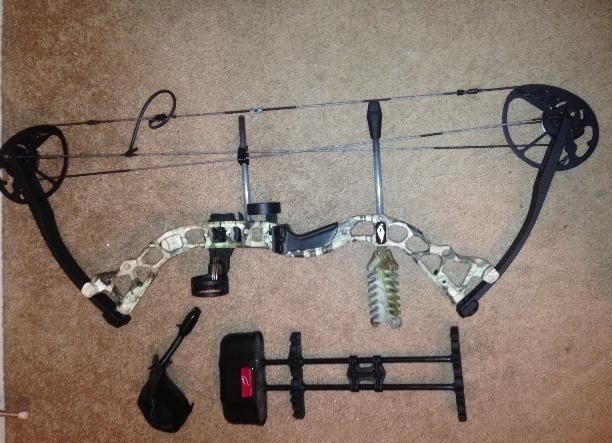 Just make sure that if you want to go hunting with this bow that you add some extra silencing accessories (see “Noise Levels And Vibration” section above for more info). The grip on the Diamond Infinite Edge is a little square-ish in shape. This is probably the only thing I did not like about this compound bow. It holds decently well, especially in a smaller palm, but I’ve just gotten so used to the ergonomic, thermal grips found on $750+ bows that the one included on this model seemed a little cheap to me. While you definitely won’t fall in love with this grip, it will serve its purpose of keeping the bow stable in the bow hand. If you’re buying it for an adult male, I’d say it’s expensive and there are some better choices for you. 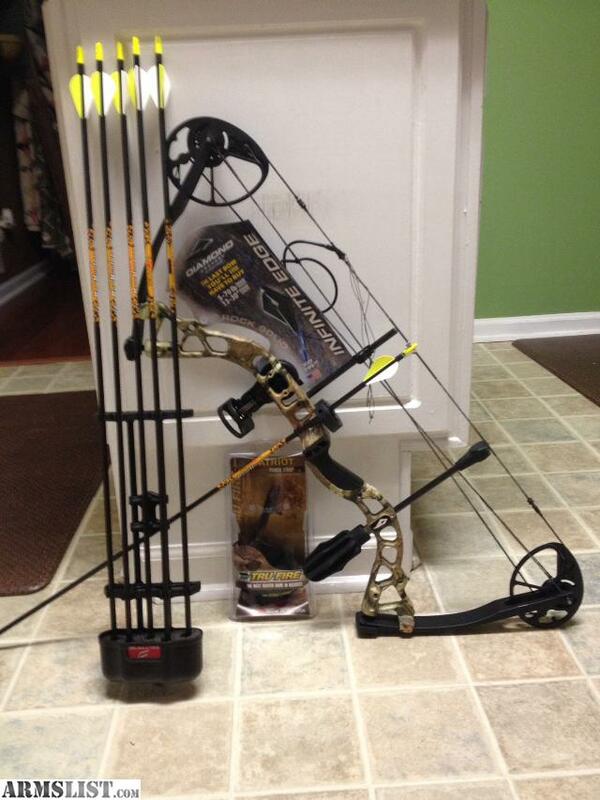 We hope you found this review on the Diamond Infinite Edge bow helpful. If you have kids who would like to get into archery, there’s no way you can go wrong with this one. You can change the settings of the bow to suit the growing needs and experience level of your kids, and the bow will still be a top performer even once they become strong and experienced. 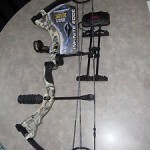 See Cabela's current price and customer reviews on the if you’d like to buy it.